This year’s Orange & White Game is shaping up to be a huge recruiting weekend for the Vols. One four-star wide receiver is already planning on taking an official visit to Knoxville for the game on April 13th, and now another highly-rated receiver will be in town for the annual spring game. According to Vol Recruiting Reports, four-star LSU commit Kris Abrams-Draine from Spanish Fort, Alabama will be taking an unofficial visit to Tennessee for the Orange & White Game next weekend. It marks the second time in a month and a half that he’ll be in Knoxville. The 6-foot, 170-pound receiver is rated as the No. 358 overall prospect and No. 69 wide receiver in the 2020 class according to the 247Sports Composite rankings. The regular 247Sports rankings are much higher on him, ranking him as the No. 230 overall player and No. 45 receiver in this cycle. Along with offers from LSU and Tennessee, the Spanish Fort athlete also holds offers from Oregon, Florida, Mississippi State, Arkansas, Nebraska, and Ole Miss among other schools. Abrams-Draine committed to the Tigers back in March of 2018. LSU offered him on March 1st, he visited March 3rd, and he committed to them March 7th. But lately, he’s been taking visits to see other schools, most notably Tennessee. He visited Knoxville for a Junior Day event on March 2nd of this year already, and he’ll be back in town next weekend. He’s also visited Georgia Tech among a few other schools this year. You can’t teach speed, and Abrams-Draine certainly has that. 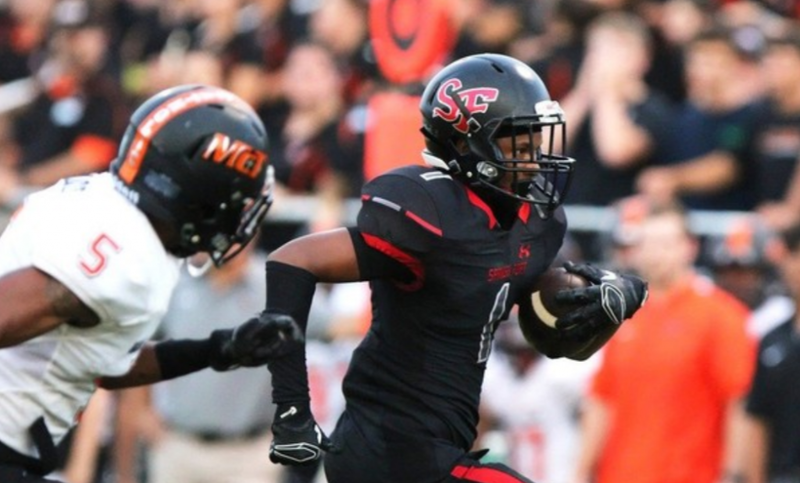 He uses that exceptional speed to separate from defenders and make some explosive plays for Spanish Fort. He’s also good at timing his jumps precisely and bringing in difficult catches. He has very strong hands and plays bigger than what he is. He still needs to polish his route running, but he’s far from unskilled there. As a junior, Abrams-Draine played a variety of roles for Spanish Fort and ended up with nearly 1,000 total yards of offense and scored 14 total touchdowns. As a receiver, he caught 44 passes for 584 yards and 11 scores. It wasn’t long after four-star wide receiver EJ Williams tweeted out he planned on taking an official visit to the Orange & White Game on Wednesday that Abrams-Draine announced his decision to visit Knoxville, too. Both receivers play in Alabama, and both are two of the top pass catchers in the state. Williams is the No. 1 ranked wideout in the state of Alabama, and Abrams-Draine is the No. 4 receiver in the state.